Every boat has a beginning and an ending. This week’s Old Boat Column presents a vignette of a vessel whose history both began and ended at Pittsburgh. The sternwheeler Mayflower, built in 1887 at Pittsburgh, was often described as being “bigger than it looked.” Constructed on a wooden hull that measured 187 feet in length, 44 feet in width and with a depth of 5.5 feet, the boat was owned by Wilson & Bailey, a boat store on Water Street. Under the command of Capt. Lew Clark, the vessel came out new as an excursion boat that mainly operated on the Monongahela River. The engines were recycled from the packet Carrier and had cylinders of 18 inches with a stroke of 6 feet. Three boilers (26 inches in diameter by 26 feet long) provided the steam. Mounting debt caused the owners to turn the boat over to the James Rees & Sons Company, which in turn chartered it to the owners of the Kate Adams, of Memphis. The Mayflower temporarily took the Kate’s place in the Memphis–Arkansas City trade. Two years later, in October 1895, the vessel was purchased by Dr. J.K. Barlow for the Tennessee River Packet Company, a Savannah, Tenn., firm in fierce competition with the noted St. Louis & Tennessee River Packet Company. On April 17, 1898, while upbound with a cargo of livestock and lumber on the Upper Mississippi River at the foot of Kaskaskia Island (near Chester, Ill.) the steamboat struck a reef and sank. The freight was heavy and the hull broke in two, but not before the City of Paducah had rescued the passengers and a portion of the cargo. The Mayflower was raised and a report was received by The Waterways Journal that boat broker Capt. John F. Klein, the new owner, had raised the riverboat and was on the way to Pittsburgh with it. Under Klein’s ownership, the boat returned to the excursion business during the autumn of 1899 at Pittsburgh, overcoming the problem of low bridges by placing a permanent bend in the smokestacks. The vessel was under the command of Capt. Ben Hebel with Capt. Joe McLaughlin presiding in the pilothouse. McLaughlin remained on the river for many decades and was reportedly at the wheel of the steamer Avalon (now the 104-year-old Belle of Louisville) on its Labor Day excursion out of Pittsburgh in 1950. As with most steamboats, the Mayflower was involved in some accidents. 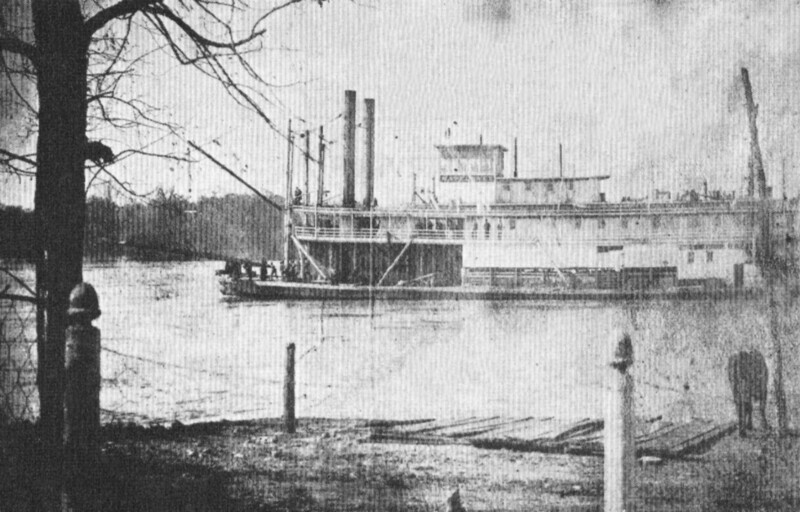 On August 18, 1900, the sternwheeler tangled with the towboat Hawk at the Davis Island Dam, but little damage was done. On October 12, 1902, in a collision with the towboat Wilmot, that vessel sustained damages estimated at $500, which included a broken sternwheel and splintered guard. On the afternoon of October 3, 1904, while moored along the Monongahela River (Capt. W.O. Rhodes was master) near Pittsburgh’s B&O depot, fire was discovered on the roof of the Mayflower; the steamboat quickly burned to the waterline and was a total loss.